You probably have a list of things you want to do in San Diego. There's a list of those just in case you haven't made your own. But - in the words of those tacky, late-night TV commercials - Wait! There's More! You won't find any extra seeds for your chia pet on this list, but don't let that stop you from reading on. What you will find here are some fun things to do in San Diego that you may not know about. Those off the beaten path sights that an adventurous person like you may want to do, now that you know about them. Chill Out at Mission Bay: San Diego has some of the nicest city parks in the state, and this one is the best of the bunch. It's a huge park, surrounded by water, with miles of beaches and hundreds of places to play. In fact, your biggest worry may be figuring out which part of it is just perfect for you. Unless it's liking it so much you won't want to leave. It's also a good place to get a glimpse of what it's like to actually live in San Diego. 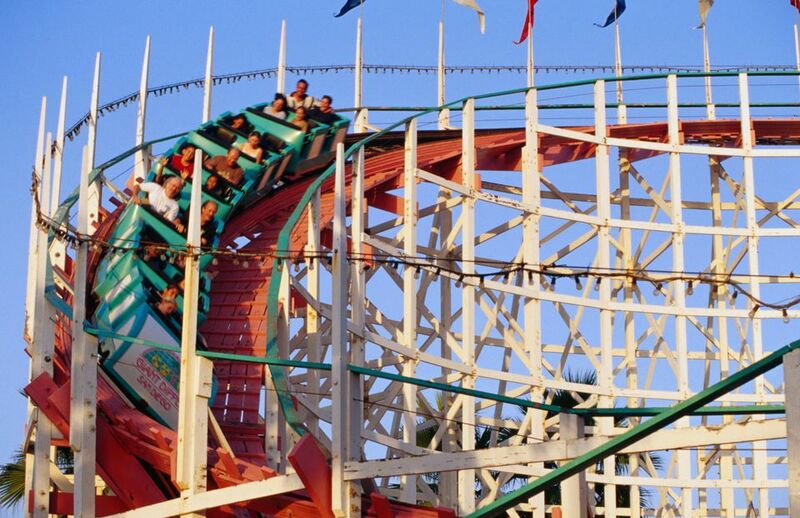 Seaside Amusements at Belmont Park: Belmont Park is one of California's few surviving seaside amusement parks, with a wooden rollercoaster, an old-fashioned Tilt-a-Whirl, a carousel, and some carnival-style amusements. Next door is the Wave House, where you can tackle an artificial wave or two — or just walk out to the beach and see the waves Mother Nature makes. You may know that San Diego's microbrewery industry is booming. You might even be planning to sample their brews while you're in town. Sampling too many of them on your own can be just plain dangerous, so do this instead. Take a Brewery Tour. This guided tour is a safe, fun way to sample some of San Diego's best micro-brewed beers. You can get in on the up-and-coming, artistic side of San Diego, a growing community that many people haven't discovered yet. Check out Barrio Logan's young artists and designers or enjoy art galleries, interesting food and fashionable boutiques in the North and South Park. That's only a beginning. The city actually has nine arts districts you can explore. No, you didn't misread that. Near San Diego, you can visit a Camel Dairy. At Oasis Camel Dairy, you can feed a camel or ride one. In the spring, you can check out their adorable babies, too. It's about an hour's drive northeast of downtown - and on the way there, you can stop in the town of Julian for a piece of their famous apple pie. You may not strike it rich at the gem mines near Pala, but you can Mine Your Own Gems. Your finds may include tourmaline, purple kunzite, and pinky-peach-colored morganite gemstones. The mine is about an hour's drive north of downtown San Diego. When they're in season, these are a few more fun things you might not know you can do in San Diego. Whale Watching: December through March is migration season along the San Diego coast. That's the time of year when mother gray whales and their babies travel between the Mexico coast and their feeding grounds near Alaska. Daily whale watching trips take you out to see them. Carlsbad Flower Fields: It's a happy side effect of growing flower bulbs: they make lovely flowers. 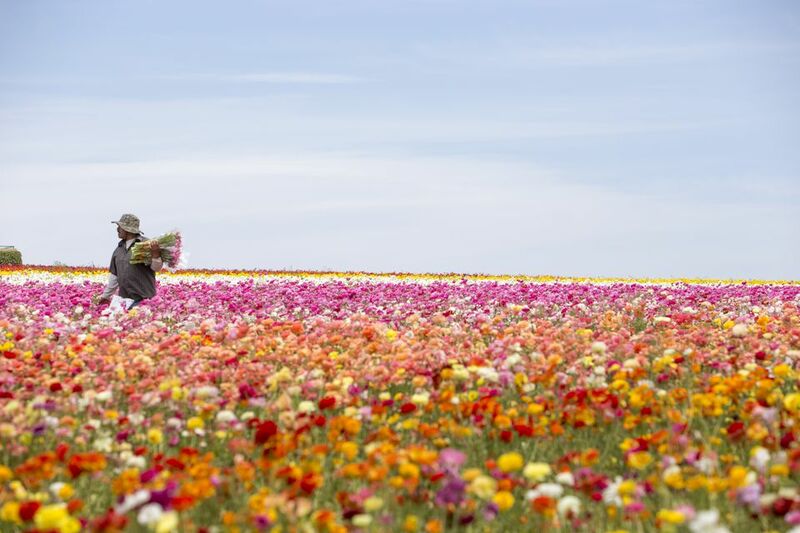 At this commercial flower-growing operation, thousands of colorful acres of frilly Ranunculus flowers bloom every March. Horse Racing at Del Mar: Del Mar is one of the trendiest and busiest race tracks in the country — and there's a lot to do there even if you don't care for the sport. In fact, spending a day there was one of my best discoveries of the past few years. There's a lot more to do in San Diego. You may also want to know why you should skip some places you've heard about. If you're traveling with kids, you'll definitely want to check out the best places to take them to. If your budget is limited (which applies to most of us), you can have a lot of fun without spending a penny. Just use a guide to things to do for free in San Diego. If you want to find out what the most popular San Diego tourist attractions are, you can find them (with their pros and cons)online. Even though San Diego weather is mostly sunny, it might rain in the winter. Check out what to do in San Diego if those raindrops start falling on your head. And if it's summertime when you visit, you'll want to know what to do on a summer night in San Diego.